Boko Haram fighters attacked a military base in remote northeast Nigeria, setting fire to shelters for those made homeless by the conflict, military and humanitarian sources told AFP Tuesday. The attack in Rann, some 175 kilometres (110 miles) northeast of the Borno state capital, Maiduguri, began late on Monday afternoon and forced civilians to flee. It followed a pattern by the Islamic State West Africa Province (ISWAP) faction of Boko Haram that has called into question government claims the group is virtually defeated. 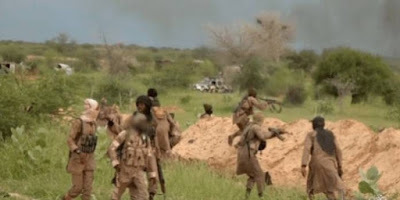 A similar attempt was made to take over a military base in Magumeri, 50 kilometres northwest of Maiduguri, on Sunday, a local community leader said. Rann currently hosts some 35,000 internally displaced people (IDPs), according to the International Organization for Migration. It has been repeatedly hit in the conflict, exacerbating already dire humanitarian conditions on the ground. A military source in the Borno state capital, Maiduguri, said the attack began at about 5:20 pm (1620 GMT) on Monday. “The terrorists took over a military position in Rann following heavy fighting,” he said on condition of anonymity. Poor visibility because of seasonal Harmattan winds hampered the deployment of air force jets, and troops were forced to withdraw, he added. An aid worker in Maiduguri added: “We have been in touch with some aid workers in Rann, who said the town had been taken by ISWAP and camps were being burned. The United Nations last week said more than 30,000 people fled after a similar attack in and around the Borno town of Baga in late December. Some 260 aid workers had also been forced to withdraw from three local government areas in northern Borno near Lake Chad, where ISWAP are known to operate. Humanitarian operations in Rann were suspended in March last year after another attack on a military base, which killed three aid workers. Two out of three health workers who were kidnapped have since been executed. Scores of people were killed in January 2017 when Nigerian air force jets mistakenly bombed the IDP camp in Rann. The Islamist insurgency began in 2009 and has killed more than 27,000. Some 1.8 million people are still homeless.